Would you ride in a car if it had no driver other than the car itself? And would that make our roads any safer? 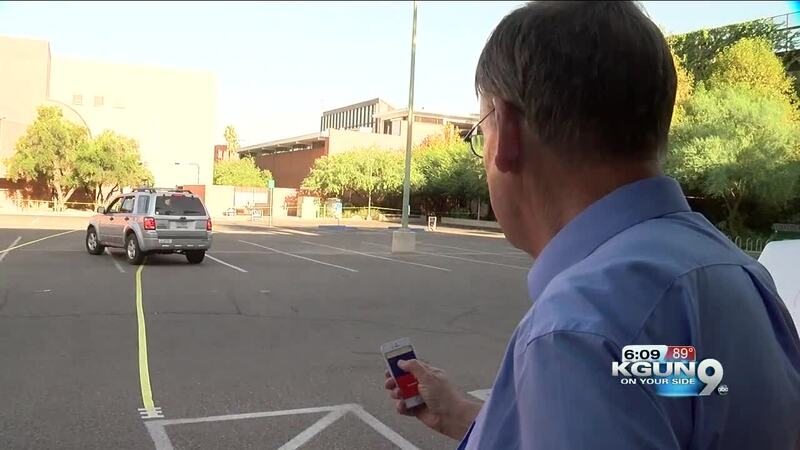 As part of KGUN9's continuing project "Operation Safe Roads" we looked at how college students are learning to program cars that will probably be in your future. In a parking lot, a car, and the college students running it, are building the skills to move self-driving cars from an experiment to an everyday appliance you'd trust with your life. They're engineering students from a long list of universities gathered at University of Arizona for a special summer program through the National Science Foundation. University of Alabama student Landon Bentley remembers when it was an achievement just to program a car to stay in a straight line. “I think when a car can merge onto the Interstate, go through stop and go traffic and come back out without having any human interaction I think that would be quite the feat. We can do some of those steps individually. But I think when that whole process is streamlined that, we'll be there." Students worked out a way to steer the car with an iPhone. Tilt left to turn left. Tilt right to turn right. KGUN9 reporter Craig Smith tried it out. "I'm gonna get ambitious and see if I can actually keep it on those yellow stripes…. "This gets fairly natural, fairly fast. I don't think I'd want to be doing high speed. Here's how confident I am. I'm bringing this straight at us." But not everyone's confident around self-driving cars. The whole idea is haunted by the incident in Tempe, where a self-driving Uber hit and killed a pedestrian walking a bike across the street. There are still questions about whether the test driver who was in the car, disabled systems that might have prevented the death. Acting University of Arizona engineering dean Larry Head says people engineering robot cars know the cars need to earn our trust. "I think the public's leery of the technology, all new technology. We're used to having to reboot our computers and things so people are concerned about it. And the industry is very concerned about it too. Safety's, number one. We don't want vehicles out on the road that are unsafe drivers. And, you know, automation could maybe be even safer than human beings much safer than the human that's looking at their cell phone." Head says engineers are working towards self-driving cars that can talk to each other, to share the roads more safely, and probably much more politely than human drivers.